Automatic feed pushing means: 24-hour-a-day access to fresh forage! Increase in feed intake helping to boost milk production. Feed is available day and night, allowing lower- ranking cows to perform better. A reduction in labor costs! 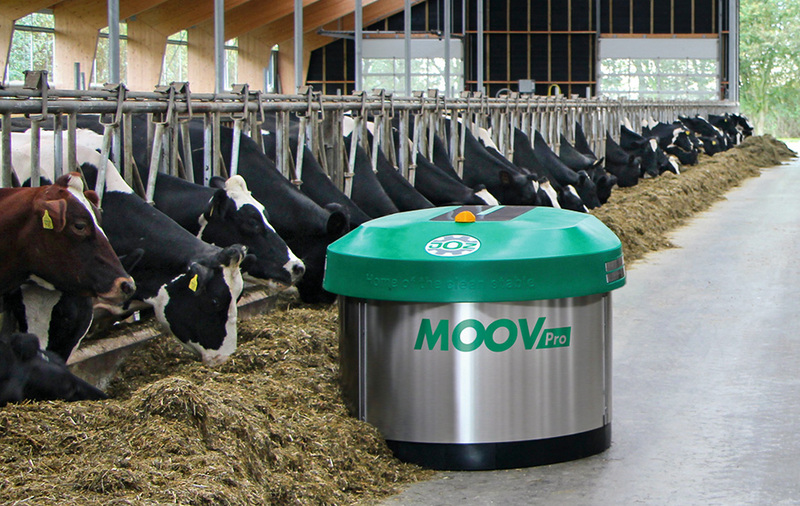 The Moov Pro feed pusher is a fully automatic robot designed for livestock farms. With the Moov Pro, your herd has access to fresh feed at all times. This enhances the cow’s health and prevents ailments like rumen acidosis and laminitis. The Moov Pro uses transponder technology, which means there are no obstacles in the barn. This technology allows the programming of an unlimited number of routes for multiple feed groups. Fully automatic charging is possible with the J-Load.